The legend at the bottom tells you the percentage of people in the state who are obese at the time of the survey (white states means they didn’t have data yet). Light blue is less than 10% and dark red is >30%. 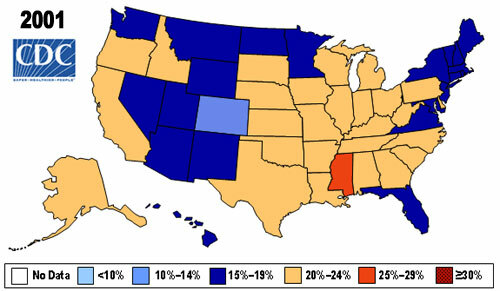 You can see that in 1985 there were not so many obese people with no states having even a yellow coloring. 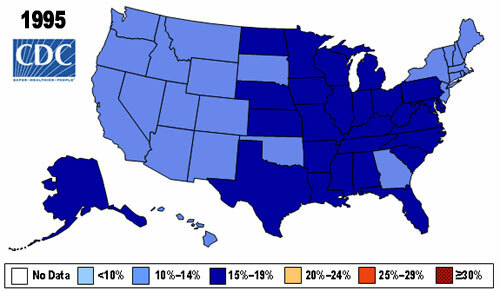 By 1990, more states were reporting and many of the light blue states are now dark blue and more people need to consider losing weight. Just 10 years after the first survey, dark blue has taken over almost half the country. 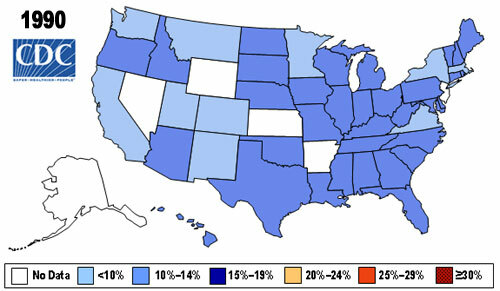 1997 is the first year we see a state top 20% obese citizens. 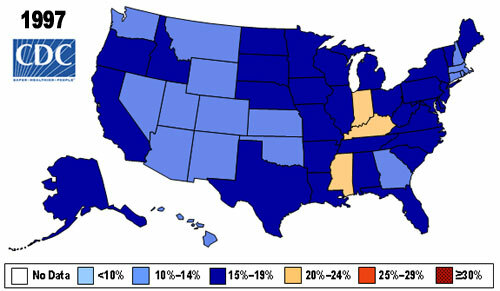 Just three years later at the turn of the millennium, there is only one light blue state and the map is starting to be overrun by yellow states and serious weight loss becomes a national issue. It only took one year for Mississippi to be our first red state. 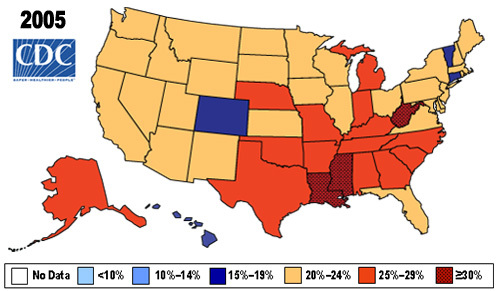 By 2005, the twentieth anniversary of the survey, the southern US is overrun by red states and we have our first states with over 30% obese. By 2010, the most recent year for which there is data, the dark red states have taken over and there are no more blue states. 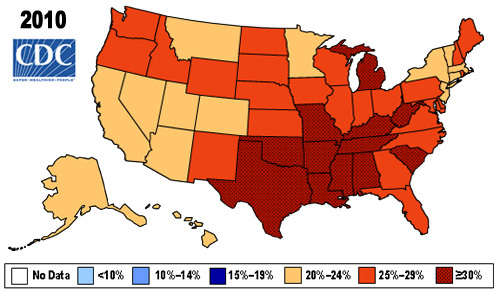 As you can see from the above maps, the spread of obesity in our country has been astonishing. The problem has progressed over 25 years to become a crisis that threatens our health and our way of life. It is for this reason that we as a nation must work to transform to a healthier way of life. We cannot let the trend continue. This is the reason why you must educate yourself, your friends, your family, and even complete strangers on the dangers of being overweight and the necessity of a real and permanent lifestyle change. This is the reason why you must commit yourself to the Counter Revolution.